As I said yesterday I only took two photo's of the exhibition but I will try to get some others of one of our other members. The first one is of one of the entries in the Challenge. The were more than 50 entries and the subject matter was amazing. We were each given three 1 metre length of DMC Perle thread and the same of DMC floss in dark blue-white and gold plus a small stork scissors charm. We had to use at least half of the thread but everyone use a lot more than that and we were also allowed to use shades of the same colours which meant we could use say a pale blue as well. The fabric was to be white and there was a size limit which if I can remember was 40cm square and 10 cm deep. There were some amazing pieces done in varying themes but I only too one photo which ended up being the eventual winner. 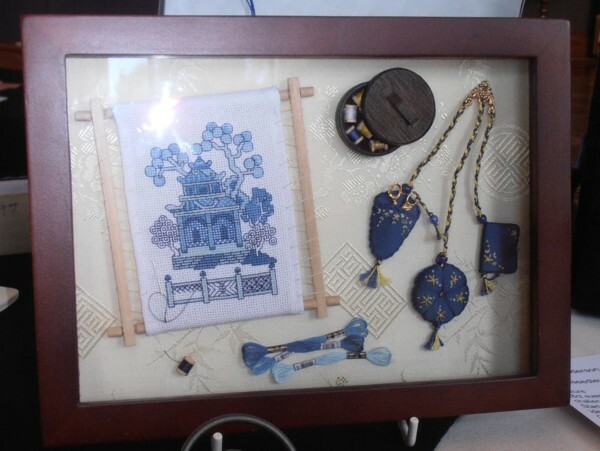 It was incredible---a minature embroidery in a frame of which the inside measured 20cm x 15cm. There was an embroidery on a frame -the fabric on the frame was 7cm x 11cm visible with more wrapped around the ends..
Then there were some hanks of floss which measured 4cm and included a tiny DMC wrapper around them. There were spools of thread that measured 1 cm long (one is down the bottom of the left hand corner and the others are in the sewing box up in the top right hand corner. There is also a tiny chatelaine consisting of a needlecase and a pincushion and a scissor keeper which contains the stork scissor charm. You can just see the top of the scissors poking out-so you can tell how small it is if you know how small those charms are. Truly this was a worthy winner. Sorry about the flash on the frame. This is a view of the hall during the set up-please excuse the rubbish up the front of the photo. 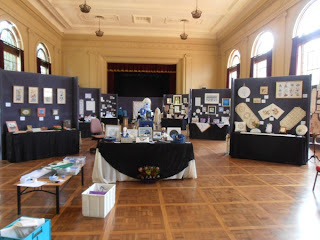 The hall where we hold the exhibition is the Albert Hall which is heritage listed and has recently been restored to all it original glory including plush burgundy velvet curtains. It is a magnificent building which costs us an arm and a leg to hire but is worth every penny of it to show off our members beautiful work. It is a lot of hard work to set it all up and I would say at a guess there would be around 40-50 members and a handfull of men working all day on the Thursday from 7.30 am until about 4.30pm to make it ready for the official opening on the Thursday night. And it all went off like clockwork. But I am really glad that it is all over until we do it all again next year. I am sorry that the photo's cannot be enlarged and I don't know why it happens this way--only doing this since the new blogger set up grrr. What a lovely venue for your exhibition - it looked beautiful all set out ready for visitors. That piece of miniature work is amazing and a worthy winner indeed. Wow - it's hard to believe that is so small!! Amazing work. The hall looks like a perfect place to have your exhibition - looks like it has lots of natural light which is so important. I', so glad it was all such a success. The hall looks like a beautiful setting for the event. And the winning piece is fantastic. I always like seeing things in miniature...this is very impressive. How I would have loved to attend this!